Boeing will train Royal Australian Navy and Australian Army helicopter pilots for the next 25 years through a $A600 million contract that broadens the company’s partnership with Australia’s Armed Forces. For the JP 9000 Phase 7-Helicopter Aircrew Training System (HATS) effort, Boeing Defence Australia (BDA) teamed with Thales to develop a low-risk solution around the Airbus EC135, one of the world’s most proven helicopters. Airbus and Turbomeca are also part of the BDA-led team. “This reinforces Boeing as a leading provider of military aviation training in Australia. We will meet the needs of the Australian Defence Force through a balanced program that makes the most of its cadre of instructors supported by flight simulators and computer-based instruction and training aircraft,” said Kim Gillis, BDA’s Managing Director and Vice President. Boeing has provided the Australian Army with helicopter pilot, aircrew and technician training since 2007, meeting or exceeding all the training and maintenance requirements. In addition to training and support, Australia also uses Boeing F/A-18E/F Super Hornet fighter jets, C-17 Globemaster III transport aircraft and Wedgetail Airborne Early Warning & Control aircraft, among other systems. 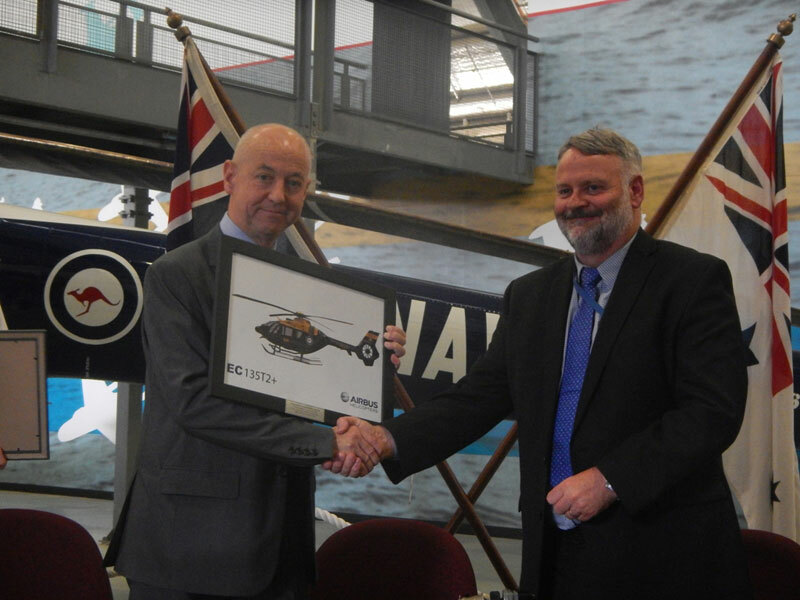 “This contract will introduce a modern helicopter training system that will support the next generation of Army and Navy aircrew transitioning to our modern combat helicopter,” said Head of Helicopters, Tactical Unmanned Aerial Systems and Guided Weapons Division with the Defence Materiel Organisation RADM Tony Dalton. “This is another very positive demonstration of how industry is partnering to provide the most comprehensive support for the Australian Defence Force,” said Thales Australia CEO Chris Jenkins. Thales is a global leader in the Aerospace, Transportation and Defence & Security Markets. In 2013, the company generated revenues of €14.2 billion with 65,000 employees in 56 countries. With 25,000 engineers and researchers, Thales has a unique capability to design, develop and deploy equipment, systems and services that meet the most complex security requirements. Thales Australia is a trusted partner of the Australian Defence Force and is also present in commercial sectors ranging from air traffic management and ground transport systems to security systems and services. Employing around 3,200 people in 35 sites across the country, Thales Australia recorded revenues of AUD $1 billion in 2013.